MCBU Time Table 2019: The Maharaja Chhatrasai Bundelkhand University, Chhatapur (MCBU) is going to organize the exam of undergraduate courses (BA/ BSc/ BCom/ B.Ed. etc). Science/Economics/Sociology/Geography/History/) and M.A./M.Sc. Mathematics 1st Semester Private/ATKTP DEC- 2018 Released!! Check the Table below. Latest Update: Revised Time Table : B.Com. 1st Year Regular/Supplementary/Ex-Student and 2nd Year Regular March – 2019 Released!! Check the table below. Latest Update: Revised Time Table : B.A./B.Sc. (Foundation – III Paper) 2nd Year Regular March – 2019 Released! Check the Table below. The university conducts the exam according to the semester format and already conducted the exam of even sem in the month of May/June. 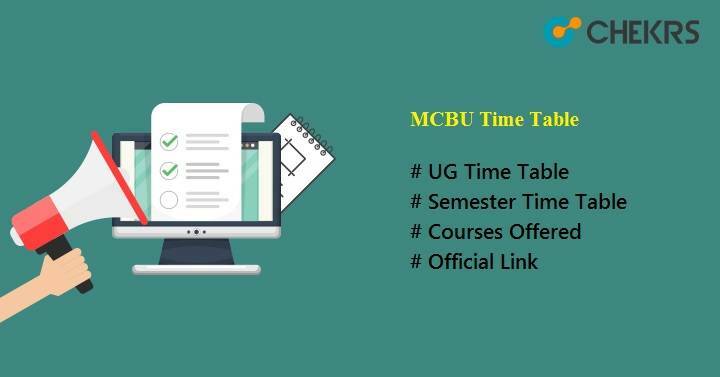 The students who are waiting for the UG semester time table of MCB University is required to know that the authorities of the university have released some of the Time table on their official site. The authorities will upload the time table according to the branch wise. Many of the students don’t know the process to download the MCBU BA Time Table so for making the sort of their problems we are giving here the steps from which the candidate can download their time table. The steps are given below. The examination section is available at the taskbar of the official of the official site. On moving the pointer to the taskbar a window will appear under which there is a link of the time table is given. Student requires to click on it. After clicking on it students require to select their courses i.e UG. After selecting the course a list of all the time table will appear on the screen. Student requires to select the appropriate link according to their choice. A pdf will open in a new window under which the details of the examination is given. Student requires to take print out of it so that they can use it in the future. Students we will soon provide here the link of the time table after it releases officially. So a candidate can prepare for their exam so that they can obtain good marks in the exams. We will provide here the link of the MCBU Chhatarpur Time Table after the official announcement given by the university. The university releases the time table before one week of the conduction of the exam. After the completion of the 12th standard, many students want to pursue their degree from the MCBU. The students are required to know that the university offers various courses under the undergraduate program. The list of the Courses Offered By MCBU is given below. The Maharaja Chhatrasal Bundelkhand University (MCBU) is a state university situated at Chhatrapur, Madhya Pradesh, India and established in the year 2015. The institution gets the affiliation form Union Grant Commission (UGC). Dr. Priyavrat Shukla is appointed as first vice-chancellor of the university. Now the universityconducts the exam of odd sem (1st/ 3rd/ 5th) in the month of Nov/ Dec. Students who don’t know the process to download their MCBU Exam Time Table is required to not to worry because we are providing here all the details of the examination from which the student can download MCBU Exam Date Sheet 2019.